Cut a thin slice from bases of pumpkins so they sit flat and cut off lids. Carefully scrape out seeds with a small spoon, keeping walls and bases intact. Place bowls on a large baking sheet, rub with olive oil, salt and pepper. Season butternut squash, carrots, sweet potato and garlic with salt, pepper and a little olive oil. 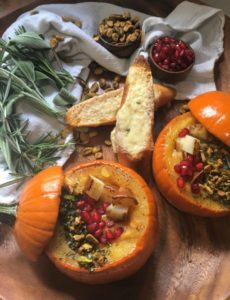 Add veggies and fresh herbs to same sheet pan and tuck garlic underneath pumpkin bowls. Roast 40 to 45 minutes (rotating pan halfway through cooking) or until veggies are fork tender. Set aside and once they have cooled off, remove skin from garlic. In a large soup pot, add olive oil. Saute onion and cook 3-5 minutes. Add in the roasted veggies, broth, cinnamon, nutmeg and wine. Cook about 15 minutes. Puree the soup with a hand held blender (or transfer to regular blender) and puree in batches. Top with pomegranate seeds, seared pear chunks or chopped pistachios.